Cala Santandria is located on the west coast of Menorca, only a few kilometres south of the old capital of the island, Ciutadella. Cala Santandria has almost become one with the two other small towns Sa Caleta and Cala Blanca. Cala Santandria is a lovely small beach, which is beautifully located 600 m inside a narrow rocky bay. The beach is covered with fine-grained, bright sand and has lovely palm trees. The water is nice and shallow and very clear. In the central part of the beach, there is an area with sun lounges and sunshades. Other facilities include showers and toilets. You can park your car in the small parking space behind the beach or on the road leading to the beach. 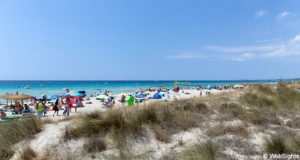 During the high season, the beach may be a bit crowded, especially over the weekend, when the local population also has time to go to the beach. 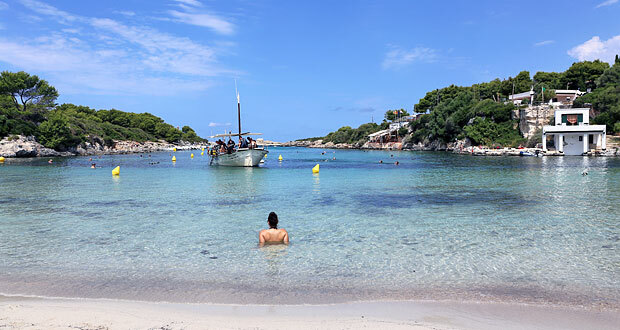 The shallow and usually very calm water makes Cala Santandria perfect for children. In the back of the beach, there is usually more room for games that require a bit more space. It is possible to rent water bikes at the beach and sail around the bay. It is also possible to sail to the neighbouring beach Sa Caleta. 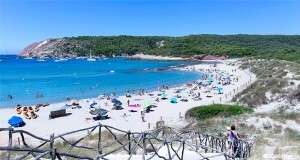 Also, diving trips are often arranged from the beach in Cala Santandria. There are three restaurants right by the beach. All three of them have a view of the beach and the bay. Cala Santandria is a small holiday resort, which has gradually been connected with the other two holiday resorts Sa Caleta and Cala Blanca. The holiday resort is located in a very nice and quiet area with a fine selection of restaurants, mini markets and tourist shops. If in the mood for a shopping trip, the tempting shops in Ciutadella are only a few kilometres away. There are several hotels near the beach, including the impressive Prinsotel La Caleta, which is getting great reviews from the guests.